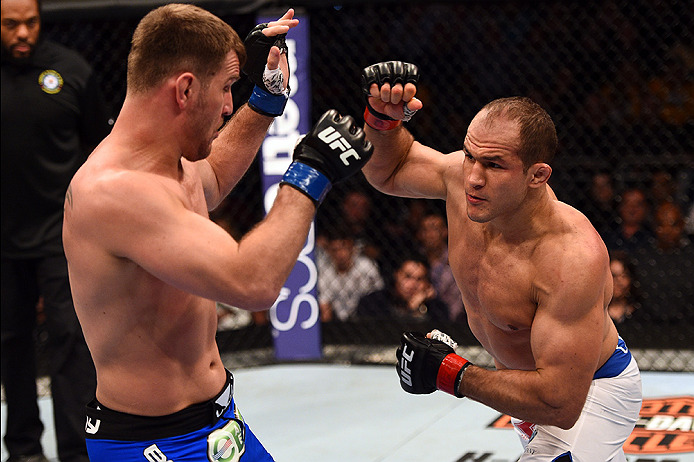 As he prepares for his UFC 211 rematch with Stipe Miocic this Saturday in Dallas, former heavyweight champion Junior Dos Santos has no problem revealing the game plan that he hopes will allow him to regain the UFC heavyweight championship. He laughs when he says it, but he’s dead serious. As Mike Tyson’s first trainer, Cus D’Amato, famously said, “People who are born round don’t die square,” but Dos Santos tried to be an Octagon when it came to his fight game. A prolific puncher with some of the best boxing in the heavyweight division, Dos Santos parlayed those skills into a 64-second win over Cain Velasquez that earned him the heavyweight title in 2011. But then the whispers started, wondering if his wrestling and jiu-jitsu was as worthy of his championship status as his standup attack was. Dos Santos listened. Subsequently, he lost the belt, alternating wins and losses from 2012 until he put a stamp on his status as the next in line for another shot at the title with a five-round clinic against Ben Rothwell in April 2016. He may be right, but only Saturday night will tell the tale. Luckily, he will be in with a fighter he knows very well, having beaten Miocic in a five-round war back in 2014. The two know each other well, and many expect this to not be a new fight, but round six of the last one. Even when the Brazilian bomber talks about knocking an opponent out, it’s with a joy that belies his profession. Simply put, a chat with Dos Santos is guaranteed to produce a smile, something Miocic found out during their recent media tour, one that featured flex battles, drawing contests and plenty of laughs. But when it’s time to fight, “Cigano” fights, and this Saturday will be no different. That’s an accurate statement. Since his UFC debut in 2008, few, if any, have fought his level of competition in the heavyweight division, and despite his ever-present smile, not having the belt that represents being the best in the world stung him. Then he listened again. To himself. Now he’s one win away from wearing that championship belt once more. That’s worth smiling about.